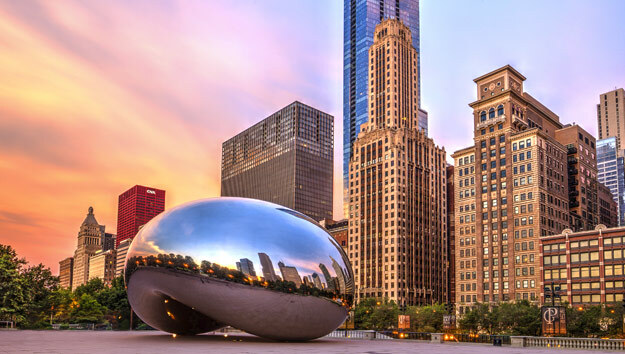 Chicago has it all – Awesome architecture, skyscrapers with fabulous vistas; world-class museums, theater, expansive parks, impressive outdoor art installations; fabulous food, wonderful shopping; a long lakefront bordering it, a meandering river snaking through it. Make the most of your time by purchasing a Big Bus 48-hour Pass and Chicago CityPass. 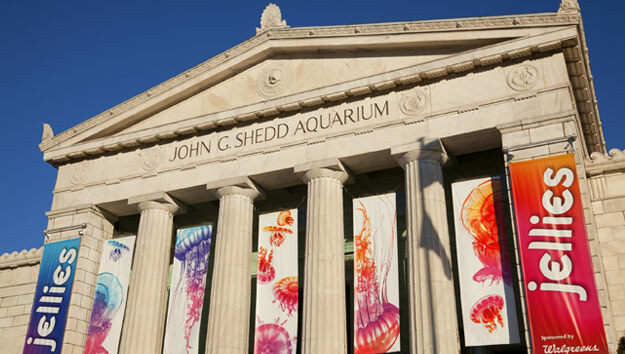 You’ll receive admission to some of the best museums and attractions at savings of up to 51%. Big Bus gets you around hassle-free to see and learn about the sights from on on-board tour guide, with the convenience of hopping off at any of the 14 stops along the route, all within walking distance of iconic Chicago museums and sights. Dearborn Marker: A bronze maker in the pavement at Michigan Ave. and Wacker Drive marks the approximate site of the first Fort Dearborn, built in 1805 and destroyed in the Ft. Dearborn Massacre of 1812. Rebuilt in 1816, the second fort was demolished when deemed obsolete in 1857. 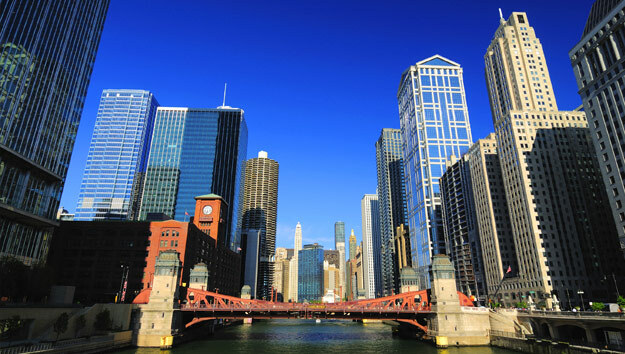 As you visit the Dearborn Marker, also get a feel for the skyscrapers looming over the river by taking a brisk stroll along Chicago River Walk. 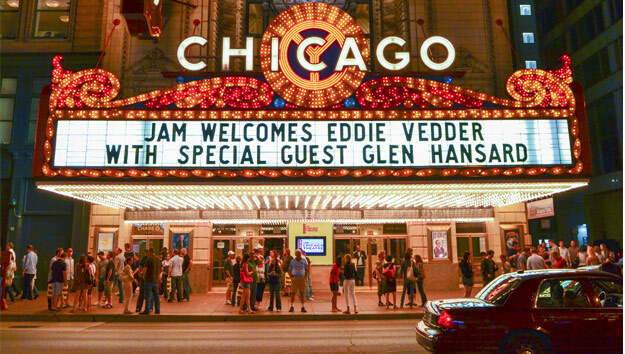 Chicago Theatre Tour: See what lies behind the lighted marquee of the first lavish movie palace in America. One of Chicago’s architectural gems from another era, this 1921 ornate movie palace is breathtakingly, over-the-top grand. Nearby are Oriental Theatre and Cadillac Place. Daley Plaza: Walk a few blocks over to Daley Plaza, anchored by Picasso’s unnamed 262 ton sculpture. Lunch at one of the many restaurants in the area. Use CityPASS to skip the ticket lines and head straight to the elevator line to go up to the Sky Deck at the top of Willis Tower. See spectacular panoramic views from the observation deck and from “The Ledge,” 1353 feet up! Interactive, touch screen exhibits and a theater presentation are interesting. To get out on “The Ledge,” a glass balcony extending 4 feet out from the building, you’ll have to queue up with everyone else. It’s an amazing sight! Stop #5: Art Institute of Chicago and Millennium Park. The Art Institute of Chicago: Use CityPass for this incredible experience! Thoughtfully curated exhibits combining the best art objects from a permanent collection of over 260,000 artworks spanning multiple cultures, some dating back 5000 years, give America’s second largest art museum its incredible depth. Chinese bronzes and jade objects are breathtaking; delicate Japanese screens and spectacular woodcut prints are archaeologically and artistically significant. Medieval art of Europe exposes a world of intricate armor, interesting arms, tapestries and metalwork. The American collection of paintings and sculpture from the 18th century to the 1950s and decorative objects from the 17th century to the present reflects the rapid development of distinct American art. The collection of legendary innovators of change – Impressionists, Post-Impressionists, Expressionists – is astounding. You can download their highlight app to decide what you want to see before you go. Millennium Park: Right next to the Art Institute is a wonderful outdoor gathering spot in the heart of the city, and a wonderful place to walk, either on Day 1 or Day 2 if you can fit it into your tight schedule. It’s a huge green space surrounded by Chicago’s skyscrapers and home to a remarkable outdoor gallery of Chicago’s signature public art collection. Check out the huge, elliptical stainless steel Cloud Gate and Crown Fountain, where the faces of Chicago citizens are reflected in a 2-50 foot Towers. Walk through Boeing outdoor galleries of large modern and contemporary art pieces. Remain on Big Bus for views of Grant Park, location of elegant Buckingham Fountain, one of the largest in the world which puts on a spectacular light show at night. End the day by spending a couple of hours at Navy Pier. It’s not nearly enough time to fully take in Chicago’s waterfront entertainment, food and shopping experience jutting out 3300 feet into Lake Michigan, but it’s fun to see. It’s open year-round, but it’s a lot more active in the summer when all outdoor venues are open and all the boating activities and river and lake tours come out of seasonal hibernation in full force. Many River and Lake tours; brunch, lunch and dinner excursions; architectural tours; Speedboat tours; tall Ship experiences depart from Navy Pier. In winter months there are many activities and venues indoors in the sprawling complex. During warmer months, the giant Ferris wheel is a favorite, as are the amusement park rides and the Carousel. The Bard takes the stage in the 9-story Shakespeare Theater; the best in action movies happen on the enormous IMAX Theater; and souvenir shops and plenty of places to grab food and drink are bustling. Who has not gazed up into the marvel of a clear night sky dusted with stars and wondered what’s out there, beyond the confines of planet earth? The Adler is the place to connect with the wonders of space. Lunar exploration, including a real lunar capsule, focuses on the journey of Capt. Jim Lovell and Apollo 13. Planet Explorers is an imaginative play area in which kids can engage through backyard stargazing, climbing on a rocket, a space station and try to reach Planet X. Spell-binding, immersive sky shows and costing extra are shown on a timed basis in three theaters. Captivating for all ages, two of the planetarium shows are included with CityPass General Admission entry. A diverse collection of marine life is divided into habitat zones –from brightly colored, darting salt-water reef creatures of the warm Caribbean to silver glinting fresh-water species of the cold Great Lakes. Exotic mysteries of the Amazon are revealed in the Amphibian exhibit filled with frogs, snakes and other creatures. Sleek dolphin glide through free-form tanks; gently-moving Beluga whales make their way over to viewing windows. Penguins are faves, as are ever-cute otters. Popular touch tanks are very popular, where May through October, kids can gently touch a stingray. Skip ticket lines with CityPass and head over to General Admission. Timed Guest Experiences – aquatic shows, dive presentations, or 4-D films – are add-ons. Not doing them does not diminish the experience. Lunch at one of 3 cafes. Sue is a 42 feet dinosaur recognized as the largest and most complete T.rex fossil ever found. As large as she is, she’s just one small part of this world-class natural history museum. Architecturally beautiful outside, inside it’s all about the archaeology, history, science of planet Earth. The permanent collection is massive in scope and diversity. Mummies of ancient Egypt fill rooms of a 3-story, 5000 year old tomb replica. Compelling exhibits focus on the lives, ceremonies, and rituals of different cultures and peoples. Hands-on exhibits illustrate how man has evolved through 4 billion years. CityPass gets you into the massive, fascinating permanent exhibit, which will fill way more than one day. Special exhibits are extra. Expect crowds. Stop #10 will place you near the south end of the famous shopping avenue. Walk and shop till you drop along Magnificent Mile, a must do for committed shoppers. In addition to the shops, boutiques, art galleries, antique stores with storefronts along Michigan Avenue, huge, multi-floored, glass-walled interior complexes housing countless stores line Magnificent Mile. Check out 900 North Michigan Shops, The Shops of North Bridge and Water Town Place (Stop #12). If you passed on Willis Tower on Day 1, use CityPass to get to the 1000 foot high observation area high above the city. For an additional fee “Tilt!” on Chicago’s 2-minute thrill ride! Climb on a glass and steel tipping platform for awesome downward-facing views! If you pass on “Tilting,” fabulous panoramic views can be seen through tall viewing windows. Keep in mind that Big Bus has a scheduled time for the final stop of the day at each stop. If you decide to stay in the area past the last pick-up time noted on their schedule, you are on your own to get back to where you are staying.